Weighing during lift allows a faster operation and more loads per shift. Ensures correct loading of vehicles or product, reducing vehicle movements around yard, helping improve site safety. Aids stock management, enabling check-weighing of incoming and outgoing goods. Can be used for weighing in all weather conditions. Warns of potential tip-over by alarming at overload point. 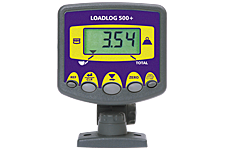 Single channel load weight display with grand total summary channel. Automatic speed of lift compensation for dynamic weighing.